As I mentioned on twitter last week, version 530-5 of Simulationcraft has been released. This is the first version to include the Theck-Meloree Index, a damage smoothing metric we developed in a series of previous blog posts. However, Simcraft is a bit daunting to some players. The program is very versatile, but that also means there are lots of options, and it can be confusing to understand exactly what’s going on. Sometimes, it helps to have someone guide you through the process. Download and run the program. In future installments, we’ll break down some of the options in more detail and talk about how to interpret the myriad of statistics Simcraft provides in its reports. First, I want to start off with some disclaimers. Simulationcraft is not perfect, and the paladin module especially so. While I have most things implemented, there are a number of bugs that have slipped through into 530-5. Some of them have already been fixed for 530-6, but I’m sure there are some I haven’t even discovered yet. One of the goals of this blog post is to get more people running the program and simulating their characters so that the remaining bugs can be identified and corrected. So if you get funny results, please share them with me. Either post in the comments here, upload the output HTML files and send me a link, or give me the contents of the Simulate window text via a pastebin link so that I can verify the results. Outside of those, I think everything is working. The only other thing that’s missing is the ability to perform shifting queues (i.e.SH1), which is something I’m working on for 530-6. For now, we’re limited to a simple SotR spam queue. The first step is to obtain and install the program. To do that, we go to Simulationcraft’s Google Code page and click on the Downloads tab. Pick the appropriate Windows, Linux, or Mac download for your system. If you’re not sure about whether you have 32-bit or 64-bit Windows, just grab the 32-bit one to be safe. Save this file somewhere convenient. Simulationcraft’s Google Code download page. Unzipping the files to D:\Simcraft\. I have several earlier versions in this folder, you’ll probably only have simc-530-5-win32. If you’re using Linux, you’ll have to build the program yourself. I’m not going to provide instructions for that here; the Google code wiki has fairly clear instructions on how to do this if you need them. The SimulationCraft.exe file. Run this. which brings up the SimulationCraft GUI. If you’re on Linux or Mac you’re on your own for this step, as I’m not sure what the files are called off the top of my head. You navigate the GUI by moving between tabs. The “Welcome” tab has a pretty good introduction to the overall layout if you’re interested, but we’re going to skip around to quickly get our Sim on. From the top tab menu, choose “Import.” This opens a set of sub-tabs with different options for importing. You can import directly from the battle.net armory in addition to other sources. For this example we’re going to use the armory. This interface should look fairly familiar – it’s literally the armory webpage loaded in a browser, complete with an address bar at the very bottom. You can navigate it as usual to find your character (if you’re EU, change the URL in the address bar first). Once you do, hit the “Import” button at the bottom right. Make sure you’re in protection spec, though! The Import screen. Click the “Import” button on the bottom right after finding your character. When you click Import, Simcraft will grab your character information and generate a simulation file from it. This is displayed in the Simulate tab. SimC will automatically use the default action priority list that I’ve programmed into it, so you don’t need to tweak this tab at all. There is a big “Simulate” button at the bottom right of this screen. Don’t push it. You pushed it, didn’t you. All right then, let’s just see what it spits out. Results section of the report. The first line gives the character name and a bunch of information: our DPS, DTPS, and TMI score. The tables under “Results, Spec, and Gear” give us a more detailed breakdown of these quantities, including error estimates. This sim was only 1000 iterations, which is the default size, but in a few minutes we’ll see how we can increase that to improve accuracy. The next section contains a bunch of charts showing damage per execute time (DPET), DPS and Vengeance timelines, damage source breakdown, and a slew of other statistics in chart form. The Charts section. This is the part that always makes the ladies swoon. Ladies love graphs. Further down the report are breakdowns of ability usage, buff uptimes and details, resource gains and losses, even more charts, proc counters, and then a bunch of statistics. We’re going to skip over the rest of that for now, because for today we’re only interested in calculating TMI and smoothness scale factors. To do that, we need to change some of the options. Iterations – increase to 10k or higher. Larger numbers of iterations give more accuracy, but also take longer. Threads – This increases the number of threads SimC can use to run the simulation, which increases simulation speed. If you have a quad-core processor or higher, set this to 4. If you have a dual-core, set it to 2. If you’re not sure, leave it at 1 and plan on grabbing a drink while the program simulates. TMI Standard Boss – this drop-down lets you select one of the standardized TMI boss configurations. Pick the option that’s most appropriate to the content level you usually play at. All of the standard bosses assume 25-man raiding (i.e. T15H hits as hard as Lei Shen does on 25-man heroic mode), so you may want to drop back one category if you’re a 10-man raider. The “custom” option uses the SimC default. As you can see, I’ve checked the boxes for Strength, Stamina, Expertise, Hit, Crit, Haste, Mastery, Armor, Dodge, and Parry. 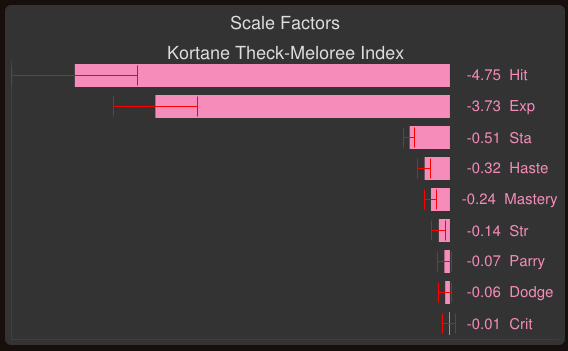 Most importantly though, at the very bottom, I’ve changed the Scale Over option to “tmi” to tell Simcraft that I want scale factors based on the Theck-Meloree Index. 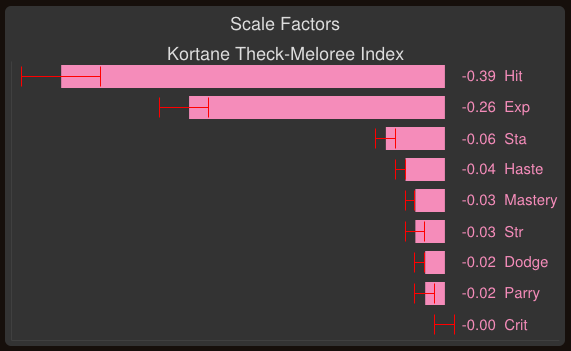 Scale factors generated for Theck using 10k iterations. These are my smoothness scale factors, complete with handy error bars to tell us how confident SimC is about those values. If we increased the number of iterations to 25k or 50k, we’d get even smaller error bars and a better estimate ofeach scale factor. Note that these scale factors are all negative. That’s because TMI uses “golf rules,” meaning that a lower score is better. So the scale factors are negative because, for example, each point of haste reduces my TMI score by about -1. On the other hand, critical strike rating has almost no effect on TMI, which is reassuring because it shouldn’t have any effect on damage smoothing. Note that unlike what we usually do here on Sacred Duty, these scale factors are not normalized for itemization. In other words, this is directly comparing 1 stamina to 1 haste to 1 armor, and so forth. So for example, with these stat weights a stamina trinket would hold more value than a haste trinket because the weights are pretty close but you get 50% more stamina on a trinket than you get haste. On the other hand, a haste gem would be worth more smoothing than a stamina gem, because you get 33% more haste than stamina on gems. You may have noticed that there’s a nice “Save!” button at the bottom right of the report tab, so that you can save these results for future reference. Unfortunately, the button doesn’t do anything. Oops. This bug should be fixed in 530-6. For now, though, you’ll have to save the results manually. You can do that by going to the \simc-503-5-win32\ folder and finding the “simc_report.html” file, which is your latest simulation result. You can rename that file to something memorable (like “theck_10k_scale.html”) to save the results. The scale factors table, which contains normalized scale factors as well as links to export these scale factors to various websites. As you can see, this table contains both the unnormalized scale factors as well as a normalized (i.e. positive) set that you can use in gear ranking websites. In 530-5 these are normalized to strength, but in 530-6 they’ll be normalized to stamina (since it’s sort of silly to normalize scale factors to strength for the agility tanks). There are also a bunch of links to gear ranking sites and online optimizers. Each of these links includes all of the normalized scale factors, so they’ll automatically load up in the site when you click the link. For example, clicking the wowhead link brings up a wowhead item ranking page personalized with the stat weights from this run. The “(caps merged)” version sets the hit and expertise values to the lowest simmed value (in this case crit). There’s also a wowreforge link, and I hope to add an AskMrRobot link in the near future. Without a little context, it’s tough to make heads or tails of the TMI number that Simcraft puts out. For example, is a TMI of 10k good or bad? For example, the T15H boss is expecting an ilvl of about 535. But I have an ilvl of 546, so I already overgear the T15H boss. Thus, my TMI is relatively low at around 2-3k. If I compared myself to the T15N boss, it would be even lower (around 700), which would make the stat weight calculations a lot more sensitive to noise. So it’s generally good to sim against the boss that most closely approximates your gear level, and when in doubt, aim high. If I sim Rhidach, who has an ilvl of 527, I’d probably want to use the T15N boss, because that boss expects an ilvl of ~522. If I do that, I get a TMI of around 5300, which is about right because he’s starting to overgear normal content. If I sim him against the T15H boss, though, I get a TMI of around 67k, about an order of magnitude worse! The reason the difference is so large is that the metric is normalized to the paladin’s health. Poor Rhidach only has about 720k hit points fully buffed, so if you pit him against a boss that can melee for 340k after armor mitigation, he’s in danger of death from 2 full melees plus a stiff gust of wind, or even a full melee plus some blocked/mitigated attacks. The 6-second moving average is going to include a fair number of these events clocking in at 120% or more of his health, and since the weight function is exponential in percentage health, they cause a significant increase in score. This is by design of course – the point is to heavily penalize large spikes that put you in danger of death, and a 120% health spike certainly fits that description. Note that the scale factors are still going to be pretty similar, though. The relative rankings will be the same, though the values may shift around some because not all stats scale similarly with boss hit size. So even if you get a TMI score in the millions, the stat weights will still be very reliable. Finally, note that I’ve only tested this extensively for paladins. A warrior, DK, druid, or monk tank at a similar ilvl may not fall into the 5k-10k range that we do. Again, that’s by design, because we don’t want to normalize across tanking classes. If a DK takes spikier damage intake than a paladin, that’s something we want to know, and TMI should properly reflect that by giving us a larger value. This was a quick-and-dirty introduction to Simcraft. I plan on going more in-depth about many of the options and reported statistics in later blog posts, but if you don’t feel like waiting, the Simulationcraft Wiki has lots of information on how to get started, tweak options, and interpret results. Also note that the simulation output is only as good as what you put into it. I think the prot warrior module is fairly complete, but I’m not sure about the DK, druid, or monk modules. The DK module in particular suffers from the lack of a good “recent damage taken” conditional, because it limits them to spamming Death Strike rather than reacting to large health changes. Since that’s very similar to the sort of information we would like to have for shifting queues, I’m working with another dev to get an action priority list option implemented for that in the near future. In addition, for the more technically-minded, I’ve written up a TMI Standard Reference Document. This outlines the official calculation method and specifies standard conditions for comparing TMI between different tanks. Since this is the initial version of the SRD, feedback on the details is greatly appreciated. This entry was posted in Simcraft, Simulation, Tanking, Theck's Pounding Headaches and tagged Active Mitigation, Min/Max, raiding, Scaling, simulationcraft, stamina, tank, tanking, theck, Theorycraft, theorycrafting, vengeance, warcraft, warriors, WoW. Bookmark the permalink. Thanks for doing this. At frist sigth simulating my paladin. Mastery weight seens realy low on TMI. Yeah, that’s actually fairly realistic under certain circumstances. If the biggest spikes are primarily caused by strings of full hits (often with minimal SotR coverage), then mastery won’t have as strong an effect on reducing those spikes. Most wow players avoid using them but … Precise Primordial Ruby and Solid River’s Heart would be worth more smoothing than a haste and stamina gems. Yes and no. We already knew that reaching hit/exp caps was more important than just about anything else, and a lot of us *did* use hit/exp gems on our first forays into MSV in heroic dungeon level gear (i.e. in the 460-470 ilvls). That said, by now most players have enough gear to fairly easily reforge to reach the caps. At that point, hit/exp are really only as valuable as the next-best secondary, which is generally haste. So gemming full haste is probably ideal for most players because they can reforge the weaker stats on the rest of their gear to make up the difference. Sorry for the huge URL, I really have no idea how else to share results. I was surprised by the high value given to weapon speed. Is this due to an SoI bug? Weapon speed weight is in fact a big factor. Not because of an SoI bug, but because of the way PPM effects work. Every 0.1 weapon speed increases your chance to proc SoI by 3.33%. So ideally you want the slowest weapon you can get. Accuracy is an order of magnitude ahead of everything else? Really? I get the value of hit/exp capping for Holy Power generation, but that seems crazy. Another oddity: Is Str really simming ahead of mastery? This is ignoring the dps aspect of it, I would think that mastery would be much stronger in terms of smoothing? Tons of thanks for your work on this. Tank theorycrafting has always been a lot more intimidating than dps, because with dps there’s generally a correct answer, whereas with tanks, the general metric is a yes/no question: did you die? . That’s not surprising, actually. You’re in a heavy haste set (dual haste trinkets) with Divine Purpose. Your health is relatively low, comparatively, so a lot of your survivability is contingent on keeping high SotR uptime. That’s fairly sensitively dependent on hit and expertise, especially because Divine Purpose amplifies your holy power generation. Keep in mind that if you check back through the qualitative assessment blog posts, hit and expertise were always our strongest stats by a fairly significant margin. When testing different configurations, I frequently got hit/exp to be about 10x as valuable as haste/stam. They aren’t as strong in my gear set because of the heavy stamina bias (I have ~950k hit points raid buffed), but especially for high-haste low-health tanks it’s fairly common. I basically stacked stam/mastery until I stopped being at any real risk of dying, then started replacing stam with haste as I got higher ilvl pieces. I’ve basically been between 700k and 720k buffed for most of this tier, but my ilvl has gone up by around 20 points. I’m thinking that I’ll need to go into a more stam heavy build in the next few weeks as my guild is likely to start doing some early heroics soon, but for now I’m enjoying the crazy Holy Power generation. Somewhat related question: Do you expect that we’ll eventually find stam break points, similar to haste break points, where it stops being as valuable because you can just soak the vast majority (95% or more) of the hits that at lower stam levels would populate the 110-140% intervals? Obviously they’ll be different between normal and heroic (and LFR, tho that seems relatively trivial), but my cursory theorizing seems to suggest they’ll be there somewhere, tho only obvious once we have a large amount of data on different gear levels. Not so much a break point as a continuous diminishing returns effect, but yes. Arguably we already hit that point, which is why the Stamina weights are suppressed compared to haste in many gear sets. As we stack more stam the disparity will only get larger. I do think there will be a more severe drop-off once you reach a certain threshold corresponding to ~4 full melee attacks, which is the worst you can imagine taking in 6 seconds. I was right there with him; I think as of this week my guild is one boss behind his, and I was sitting around 960-970k health raidbuffed when I ran my stam heavy trinkets. Then when I saw the new sims, I did an AMR comparison of what I’d be trading—I traded 77k raid buffed health for 14% haste by completely re-gemming for pure haste. I’m… cautiously optimistic and very excited for tomorrow’s raid. Oh nevermind, it was the holy prism bug you mentioned earlier. Switching it over to execution sentence bumps me up to a 766 TMI which still feels utterly ungodly. When I simmed Treckie and Slootbag, I frequently got TMI’s under 1k. But they’re generally sporting high haste builds with 75% uptime on SotR and massive self-healing. I’ve been wanting to do a complete stam->haste conversion one week just to play around with it, but I really needed the stam for Animus because I was tanking massives. May swap to haste this week since it sounds like Lei Shen is more forgiving, as it’s primarily physical burst. *smack* we’re starting Animus this week as well…. and I”m almost certain I’ll be tanking massives. Bleh. Good thing I have a stack of Solids sitting in my bag. Just regem right before, I guess? woops. url got cut off and I cant delete comments. I’m also sitting here grinding my paladin (armory http://us.battle.net/wow/en/character/perenolde/Zothor/) at basically Theckian gear levels (I am inappropriately proud of that…) and a bit uncertain as to some of these results. I’ve posted my full sim at http://db.tt/yJ35St8o and am a little concerned about a couple elements of the results. Hopefully someone with a sharper eye than me can find some of the issues. The big thing that jumps out is that, at effectively the same ilvl, I’m pulling out a 1346 TMI to your 2788. That’s kind of silly; even assuming that minor variations in our gear it shouldn’t be that drastic a variance against the same content. Two data points may help explain this, and I wonder if there’s a bug in the sim: First, if you scroll almost all the way down to my Health Timeline, you can see that for some reason i’m spiking WAY up on a periodic basis. I think this might have to do with the fact that I’m getting the LMG Fortitude buff, and I don’t see it on your sim. Do you not use it? Did you not have it equipped for some reason? And is it really THAT good for smoothing purposes? I’d always assumed that its random nature limited its smoothing value, but with a weakaura to know when its up and the exceptionally high uptime it has, I’ve been unable to give it up anyhow. The other thing is, like the previous poster mentioned, the anemic value of Mastery. This is wayyyyy behind your Monte Carlo sims, and, more to the point, Mastery is coming in behind Strength—despite, to the best of my knowledge, strength offering nothing but a bit of parry (as well as, of course, DPS). The Index doesn’t include its DPS value though. Is this a result of not having the SH1 queue? Or is mastery really as much of a dump stat as this makes it out to be? >.< the tool is awesome, especially for things like "hey, is this heroic haste/mastery agi ring an upgrade?," but the results concern me. Keep in mind Strength also boosts SoI healing and SS shielding. Though I agree it does seem odd that it’s above Mastery. We’ll have to see if the SH1 setup does anything to fix that. And by LMG I assume you mean Legendary Meta Gem? I would expect a 20% damage reduction boost with a high uptime to behave quite well with smoothing analysis given that the high-end spikes are weighted the way they are. Come to think of it, it’s possible that the Meta gem was causing the drop in Mastery in the first place depending on how they interact. If the 20% DR is up then the value in reducing the hit even further is going to be less I think. The periodic health increases aren’t LMG, they’re Holy Avenger. They show up in mine as well, though the magnitude is smaller. I’m not 100% sure on why they’re different though. It could have to do with the LMG buff – I apparently had my alternate helm (with the Crit/DPS meta gem) equipped, so Fortitude won’t show up in my sim. Basically, when HA is up, you’re actually producing more self-healing than you’re taking in damage, so your health rises. If you test out really high-haste sets (try Treckie or Slootbag, for example) with Divine Purpose, you’ll actually find they’re self-sufficient against a T15H boss. As in, on average, they could stay alive without a healer. Obviously that’s an aggregate measure over all iterations, so that’s not as overpowered as it sounds. 1) The lack of the SH1 queue. If you remember, mastery was fairly inferior to haste before we instituted shifting queues, and that was before we even had Sacred Shield or SoI implemented. I expect that SH1 will raise the value of mastery significantly. 2) I think that it’s important to be careful about equating the Monte Carlo results to this. The comparisons in the MC sims were between entirely different gear sets – i.e. one pushing haste to the sky vs. one pushing mastery to the sky vs. one pushing avoidance to the sky. We inferred from that a relative value of haste or mastery. But that’s not, strictly speaking, what we’re doing here. The value of each stat will move around as your gear set changes. Adding 1000 mastery to the Control/Haste gear set will give you a different stat weight than adding it to a Control/Mastery, Control/Avoidance, or Avoidance gear set. What we’re seeing here is a sort of natural diminishing returns on mastery. In the high haste gear set, you have pretty high SotR uptime (say 50% or so during non-HA periods, since we’re not using Divine Purpose). That means we’re covering on average 2 out of every 4 melees with SotR. The biggest spikes we see are cases where we take 4 full-size (unblocked) melees in a row, with perhaps one or two of them covered by SotR. In that situation, adding 1% mastery will shave off a little bit of damage, and maybe increase the likelihood that one of them is a block. By comparison, more haste might let us guarantee 2/4 or even 3/4 coverage, which makes a big impact. Strength and avoidance reduce the frequency of those events, which may be more advantageous. And strength adds healing to SoI and absorption to SS, so it’s doubly effective. If you’re curious, try simming Attack Power as well for comparison, that should give you an idea of how much of strength’s value comes from SS/SoI. So in short, I think mastery is going to be very strong in situations where it covers many hits and/or covers one big attack (i.e. talon rake). But TMI is sensitively affected by those most dangerous events, so if those events are getting only partial coverage of SotR, it may not be as strong as it is when it’s the only stat you stack. That said, it could also be some sort of bug we haven’t found yet. I’ll try and go over the code with a fine-toothed comb to make sure there’s nothing missing; hopefully you and others will do the same with the reports. All I heard was we can solo Heroic 25 T15, thanks Theck, 1 man guild inc. But seriously, amazing post, well accomplished and an unparalleled guide that can now be referenced and used for tank gearing. There is an “Armory Region” drop down in Global options. If adjusted the import tab will always load the specified region. Yeah, but I hadn’t gotten to the options section by that point in the post yet. Haste is possibly a bit on the high side 0.23 compared with stams 0.17, personally I was expecting it to be the other way round. Will have to have more of a play with it over the weekend. The stat chart link is broken for me, but the haste/stam weights depend a lot on your gear. In my gear, which is stam-heavy, I tend to get haste>stam. If I sim a very haste-heavy character, it tends to skew towards stam>haste. However, that’s also relative to the boss you choose. You should get a much higher stam weight against a harder boss. For example, if I sim against the T15LFR boss, I’m pretty sure haste would be way ahead of stamina just because it hits for almost half as much as the T15H boss. I am very haste heavy (46%) and it still values haste>stam on T15H. Is that maybe due to out gearing T15 heroic now? Yeah, I’d say so (TMI < 1k, that’s on par with Treckie). If you look at your health timeline, you’re basically self-sufficient against that boss. You’re probably just beyond the point of needing any more stamina because of your sheer self-healing capability (99k HPS vs 59k DTPS). Why do we not have a line to put up Sacred Shield pre-pull? I always have SS up for a pull (ideally apply the 30 sec buff 6 seconds before a pull so I have a small shield on for first boss AA) and typically do a quick refresh a few GCDs into the fight and another once vengeance is stable. I presume this wont make a huge difference, especially because a no vengeance SS absorb is likely somewhat negligible in the long run. Just curious if there was a reason it wasn’t plugged in there. Because I didn’t know how to code the action priority list line for that when I threw together that basic APL. It’s one of the improvements I have planned for the APL once I figure out how to do it (and I know it can be done, I just haven’t had time to figure out the syntax). If you already know the appropriate syntax, please share! As I said, I don’t know SimCraft well enough to gauge if that’s working. That run gave no errors and didn’t effect my simmed dps on 25k iterations, so I just presume its working. No, there’s definitely a way to do it in the precombat APL, but I think it involves a hack (like setting the duration of the buff to 5 seconds so the first tick occurs shortly after). One of the other devs mentioned it to me in passing at one point, I’ll have to pick their brain again. Pre-Combat Actions really are a bit of a problem, because SimC does not have a concept of pre-combat time. It is set up to just execute all pre-combat actions instantly at t=0, and then start combat. This means things like pre-combat potions, or other buffs require custom, (hardcoded) precombat implementations with a time-malus, eg. -5s. I’m just learning SimCraft myself (been using it for 3 weeks on my ele sham), but if I figure it out I’ll post it! Did you see my comments/questions on the old blog posts? I’ll read the SRD and let you know what I think. I forgot to mention in my previous post; is there a reason we’re not distinguishing between heroic 10 and heroic 25? And, I suppose, normal 10 and normal 25. The fact that Heroic 25 hits like a truck is why some of us parrot your stam bias, but given my current lack of dyingness these days… I can’t help but wonder if I should be shifting to a pure haste design, even in 25. I had always perceived it as a 10H v 25H thing, but it seems even a few of the 25H paladins are biting the bullet and going straight yellow. Partly because I sort of expect that the T15N boss would be suitable for 10-man heroic. The key is that we have at least one boss that represents the maximum (25H Lei Shen) and several intermediate ones at reasonable intervals. If you sim against the T15N boss, that will give you similar results to simming against a boss with slightly higher raw swing damage. I’d have to look at what 10H bosses hit for, but my guess is that they’re going to be in the 750k-800k ballpark, which is close enough to the T15N boss profile. You may want to indicate somewhere that those bosses are the 25m heroic ones, then. New tanks might not even know 25m bosses hit harder. Ahh, T15H is actually hitting like 25H already, excellent. I thought I mentioned they were 25-man, but I guess not. I’ll edit that into the article. That’s all well and good to be able to substitute 25N for 10H, but doesn’t really help for 10N. Unless we’re supposed to substitute LFR in for 10N, but honestly I can’t see that being accurate. I can’t imagine that a LFR boss is as likely to kill me in the same window as a 10N boss. Any particular reason why glyphed Divine Protection isn’t cast on CD, by default? Seems like it would be something you would allow in TMI calculation. At the time, I wasn’t certain how I wanted to handle cooldowns yet. Glyphed DP is a pretty large effect, especially with 4-piece. And ideally you’d want to weave it in around other cooldowns (i.e. conditionalize Holy Avenger so that you don’t cast it if Divine Purpose is active, etc.). Now that I’ve decided to allow limited cooldowns, I’ll probably add it to the default action priority list. 4-Piece still is looking pretty lackluster compared to the haste off-set pieces though, isn’t it? Especially thunderforged. Does it perform any better in SimC than we expected in the previous model sims? somewhere in the APL and sim two gear sets, one with 4-piece equipped and one without. AskMrRobot has an option to export your gear to SimC format, so you could probably just load up your own character, change a couple items to enable/disable 4-piece, and export. I know this is mainly paladins, but I just couldn’t resist simming my Death Knight. This doesn’t seem right either, mastery being clearly worst. Besides that, it spend 30 seconds doing necrotic strikes. Under abilites and damage stats, death_strike_heal show up, and does 42.6% of my damage. And to top it of, all my health gains appear to come from touch_of_the_grave (forsaken racial). Something seems very of here. Removing NS from your rotation drops the TMI from 320k to 136k. But obviously there’s still something else. 320m to 136m* for the Custom boss. Played around with the rotation for quite awhile and didn’t get it below 100m for Custom. And it has Icebound Fort on there, too. Removing Death Strike from the priority list increases DTPS and TMI, so it’s doing something. Restricting it to health below a certain percent decreases TMI. It seems a bit glitchy, though, since it’s not showing on healing received. Also, gating Rune Strike to only use it at very high runic power or when out of Unh/Frst runes (since you’re talented for Runic Empowerment) seemed to make virtually no difference in TMI or DTPS, so it’s possible that talent is unimplemented. tl;dr it seems Blood DK code is glitchy or incomplete, most likely both. I believe SimC is open-source (i.e. its full source code is available for download) but I don’t know DK well enough to edit their rotation to something I’m confident is useful and practical, or even write sim code. The problem is finding someone who does know DK well enough. I believe there is a coder in charge of DKs who may be looking to refine DK code soon, or at least Theck gave me that impression from a previous blog post or comment or something (idr or I’d link you to it). It is open source, and there is at least one other DK developer that I know of. I’m not sure how active/experienced they are though. I can always make changes to the DK module as well as long as people point me in the right direction (i.e. tell me what’s broken). Also, at the least, it’s not using Lichborne-DeathCoil to heal, nor is it using Death Pact, despite being talented for them. There are a number of issues with the DK module. The TMI calculation is being done properly (it’s the same for every class), but the errors/issues in the DK module are inflating the value because you’re taking frequent large spikes. The biggest one is probably that the APL is just spamming death strike, because it has no concept of “damage taken over last 5 seconds.” A good DK times this so that they get the most out of their Death Strike – both by offsetting the largest spikes with healing and getting larger absorb shields. I’m not even sure, at this point, if the healing/shield provided by DS is scaling with incoming damage *at all,* but my guess is that it isn’t. This is something another dev and I are working on fixing, but we need to implement an APL conditional like “if=damage_taken_in_last_5s>X” or some such. Ideally based on percent health or normalized to boss swing size rather than raw damage. I also have no idea what the “ideal” APL would be for a Death Knight. So any suggestions you have to improve it are welcome. I suspect you’re reading the ability list incorrectly though – death_strike_heal will probably be generating 42.6% of your *healing*, not damage. The ability table lists HPS as if it were DPS (maybe that’s something that should change for clarity though). I suspect DS’s damage component will be listed under “death_strike”. As far as the scale factors: it’s going to be hard to trust them if the APL (and possibly mechanics) are completely broken in the first place. Garbage in, garbage out. I’ll ask the DK dev to take a look at Runic Empowerment. Oh, I see. But, as I said, removing DS from the queue at all increases DTPS and TMI by ~50%, but it’s not showing on healing received, which is also of concern (This graph: http://imgur.com/8Xs6TZQ ). Neither are Blood Worms exploding, or Rune Tap. Can you link to the full HTML report? I assumed you two were just misreading the table regarding death_strike_heal, but that graph definitely suggests it’s not healing at all. That would be a pretty huge loss in terms of TMI, since that’s a huge part of DK active mitigation. Here’s a google docs link. Let me know if you can’t see it. Yup. That works. Very curious. Death Strike definitely shows up as healing on the ability table. As do bloodworm’s burst. But neither are being counted on the chart. I’m pretty sure IBF’s cooldown is longer than 14 seconds. Somehow the spell info is suggesting it’s 12. Curiously, the buff uptimes look correct (187-second recast interval, ~7.5% uptime), and the spell info under the buff suggests a 180-second cooldown. But that seems inconsistent with the cast count. I’ll have to pore over this some more, and possibly do some debugging in VS. I suspect the DK module is a lot more buggy than we thought. I’m not used to simulation craft, but looking at the health change you shortly get negative health. How does that work for the sim with <fixed/% health? Since if the sim consider you at negative health, I guess all "use this below" just will use them on cooldown instead. Oh, ok, I was afraid that may be the case. Which makes health checks rather useless, yeah. I wonder why I saw a significant difference by adding them in, then, since really all it did was mitigate the first spike (if any) and then spam Rune Tap/Death Strike. Guardian druids have a similar scenario with their default APL in that once they go negative health they spend almost all of their rage on Frenzied Regen instead of Savage Defense, thus keeping high up-time on a HoT but no dodge active mitigation. Could it be that the DS is shielding but not healing? I just made another quick simulation to look at my dps, and for a LFR boss it suggest I would do 120k dps. This is much higher then I normally get close to. The action list also dutifully does runetap every 30 seconds, however, it also does both blood boil and death strike every 10.75 seconds. Wait, 10.75? The rune cooldown – before counting RE/RC/BT is 8.33 seconds… On the second hand, it’s heart striking every 6 seconds, indicating that it somehow prefer heart strike to saving runes for death strike. I completely removed Heart Strike and Necrotic strike, and my TMI halved to 451k (just 1k iterations for now), but my DPS still seem much too high at 100k. Atleast it does use Blood Boil/Death Strike every 7.2 seconds instead (no timing in the model). Still only Touch of the Grave healing. I looked into this, and DS, Bloodworms, etc. are all healing properly. It’s just the chart that’s screwed up. Basically it’s an accounting issue (we’re not attributing healing done to a particular effect, so it’s being ignored for the chart). Hoping to fix this for 530-6. This would also explain why changing Rune Strike to only use when it will return runes used by Death Strike did nothing — because the rune detection isn’t working, so it’s still using it at 40+ RP. Alternatively, perhaps the pre-combat Army of the Dead and Bone Shield rush into combat without letting those runes come back up? As you identify potential errors, would you mind opening an issue for each one? This makes it a lot easier for the people working on the DK module to track/fix the errors. Far more efficient than playing whisper-down-the-alley with me. From what I heard a few months ago, Blood doesn’t army pre-pull now, as it snapshot AP, and you have no vengeance. Since you likely will only army once during a boss fight, it’s worth saving for a high vengeance period. It’s good that the DS is healing properly atleast, but then I wonder what the extreme amount of TMI is comming from. Remember, even when I look at LFR which I supposedly heavily outgear now (513 item level), I get 450k TMI. Added to that, I somehow get 100k DPS with not using any heart strikes. Granted I don’t play perfectly, but I seem to recall getting about 85k on Jin’rokh last week, and that’s standing as much in pools and such as possible, and mostly having him one me. Is there any way to see what vengence levels you get during the sim? Looking at the boss strikes, they hit for 140k and the dot tick for 120k every 30 seconds. Looking at the worst case scenario over 6 seconds, that’s still only 4 attacks (may be 5 depending on variance.) Let’s assume 5 and a dot tick, that give us total 820k damage. My raid buffed health is 811k. So even at the very worst case scenario with all attacks hitting, the dot ticking, and taking no healing or using any damage reduction, it’s still “only” 101% of my maximum health. That’s the very worst it can get. And somehow I with those stats get 450k TMI. If I didn’t mess up the actual calculation, something is clearly very wrong. Wich I could help more with that, but I’m afraid it wouldn’t be very helpful to say “this is very odd, I don’t know why”, as it feels my feedback is on at this point, sadly. I think your worst-case TMI calculation is even over-shooting it. The DoT should tick for 15k every 2 seconds iirc. I’ll take a look at the code and see if I can figure out what’s causing it. Maybe death strike heals are occuring but not being tracked appropriately on the helath change timeline? By the way, there should be a Vengeance timeline in the Charts section. That will tell you what your Vengeance level was. Can’t believe how I could miss the vengeance timeline… It seems higher then I usually get in LFR though, not sure what’s going on there. As for the dot, the information say Count: 15.2 Intervall: 30.54seconds DPE: 119477 – My interpretation was it ticked every 30 sec, for 15 times total in the fight but I see I was wrong now. There’s a “ticks” to the right. Adjusting for this – 5 melee and 4 ticks – we get instead TMI 123k with no healing or avoidance. Assuming I am doing the TMI calculations correct still. thanks you very much theck. Can’t wait for a version with SH1 inplemented. Is there any way to adjust vengeance besides chainging the “TMI standard boss” option? They’re all pretty unrealistically high to be honest. How are they unrealistically high? The LFR boss hits for 150k (after armor mitigation) every 1.5 seconds, that’s gotta be lower than 10-man bosses. At any rate, I know the T15H boss is a good approximation to 25H encounters. Granted this would be a bit like solo tanking as you have the boss on you constantly, but I very rarely get much over 100k in LFR. Most of the time it’s more like 50-80k, and the sim suggests 139k. Ofcourse I don’t constantly look at and evaluate my vengeance numbers but it should be around there. It’s entirely possible I’ve over-estimated the Normal and LFR bosses then. We should scrutinize some logs to figure out what sorts of unmitigated hits tanks are taking from bosses in each format then. Lei Shen should be a good test case, since that’s what I’m using for the T15H boss. The T15H hits for 900k pre-mitigation, which is ~340k after spec and armor mitigation on a paladin. That’s roughly Lei Shen 25H. The T15N boss hits for 750k pre-mitigation, and the T15LFR boss hits for 550k. I intended for those to be ~230k and ~150k, respectively, but I may have overshot. Using the same 37.78% ratio that the T15H boss gives (340/900), those are hitting for ~280k and 208k. I was tempted to call those middle ones T15H10 and T15N25, but I honestly don’t know which hits harder, 10H or 25N. I guess we could also go whole-hog and do one for each possible difficulty, but that starts getting sort of excessive unless we can pull boss melee data from wowhead or something (which I’ve asked about, so we’ll see). We really just need a gradient between LFR and 25H. Going off my logs and only taking into accounts spec bonus (25% for warriors) and armour reduction (60%) I’m seeing T15N10 only hitting for 90-110k whichwhat 300-350k un mitigated damge? If it’s truly just 25 and 60% reductions (which should be an effective 70% reduction) then the 90-110k after mitigation would be 300-366k before. Are those full-sized (i.e. maximum) values, or averages? i.e., we don’t want to average blocks into that value. On Lei shen, the smallest unmitigated hit i’ve seen taken is 270k, the largest is 525K. Granted with prot warriors and a Disco priest healer sample size is smaller than i like, but I can only go so far back before gear changes and upgrade affect my DR from armour. but for most fights where i only take Boss melee ( no adds) and look at the Hits coloumn on WoL’s Damage taken by spell page (so ignoring blocks and absorbs, avoidans, but not % damage reduction CDs) most of the 10 man bosses are averageing 90-110K mitigated melees. 270k seems high for Lei Shen 10N. 525k is almost certainly from a period when the Decapitate debuff is active. None of those occurred while Decapitate was up, so It seems like Lei Shen’s 10N attacks are hitting this tank for 150k-200k, with a normal size of around 175k. This tank has ~58% reduction from armor and the base 15% from spec and 10% from Weakened Blows. So the overall damage taken from an attack should be (1-0.58)(1-0.15)(1-0.1) = 0.3213, or 32% of the raw value. Using a post-mitigation value of 175k, that gives me a raw swing of 545k, or pretty close to our T15LFR boss. That does mean that we’re almost certainly over-estimating the T15LFR boss, though. I’ll have to troll some 10H and 25N logs to get rough estimates of those values. So 340k seems like it could even be an underestimate of the largest melee (420k! ), though probably a reasonable estimate of the average melee. I should note that while I haven’t copied all of the SotR spam, all of the attacks taken while under the affects of Decapitate are covered by continuous SotR uptime. None of the others are, though. Still, we should discount them from our averaging. So it looks like 10H clocks in with a range of 200k-290k, making the average likely to be around 245k. Again, none of those affected by Decapitate or SotR. So 25H clocks in between 250k and ~300k, so probably safe to call it 275k. That suggests about 200k swings outside of Decapitate. It makes some sense though, higher than 10N, lower than 25N. I actually expected it to be less than 10N though, so take it with a grain of salt. I was surprised too at first at the premise that an LFR boss was hitting as hard as a 10N boss, let alone harder, but I think I know why. We’re only looking at how the melee swings differ between difficulties and sizes, we’re ignoring the magic/ability components (or perhaps incorrectly assuming that they scale similar to melee sizes). The dot hits twice as hard in normal than it does in LFR, and in fact the magic damage seems to scale based on difficulty alone regardless of raid size. Looking at Iron Qon’s impale the damage sizes for each setting is (same order as above): 25k, 40k, 45k, 50k and 65k. Again, there’s a large jump between LFR and 10N, and a similar jump going from 25N to 25H while the other are smaller gaps. Primordius’ stacking dot is even weirder, apparently doing 10k per stack in LFR and 20k on every other difficulty (the only one I saw with no variation between 10/25/N/H). The flaming meg head’s breath and dot do the following (in the form of breath tick with dot tick in parenthesis again per stack): 70k(16.5k), 89k(21k), 165k(39k), 127k(30k) and 165k(39k). Again, LFR is lower but not by as much, also even though 25N is higher than 10N, both heroic sizes are the same. The extra frost damage from Malak’s frigid assault mirror’s Lei Shen’s results with 41k, 75k, 97k, 75k and 97k. Again scaling with difficulty alone and not raid size. Maybe mix and match the melee and spell damage as well to ensure that we’re “aiming high”, such as the 10N model using normal mode magic damage and LFR sized melee swings. Don’t forget that in a 10N you also have 2-3 healers behind you, and in LFR you have 6. Even if you’re taking the same amount of damage in both difficulties, you’re probably less likely to die in LFR. That also potentially means that a higher TMI in 25m is more acceptable than in a 10m. The difference in the DoTs etc for LFR I think is to 1. not punish tanks as much for low raid dps (in a case like megaera), and 2. make messing up at tank swaps less punishing. Lei Shen is ~200k a hit in my gear. I was solo tanking. Attack timer seem to be about 1.5-2 seconds (tried to stopwatch it). Vengence was at around 100-110k until last phase, where it got to around 170k. Iron Qon hit for around 150k, reached about 110k vengeance in last phase, Blood Presence give 10% damage reduction, and my armor give 55% damage reduction. Which version of Lei Shen? 10N, 10H, or 25N? 25H definitely hits for ~340k. I kept most attention at the pull in the beginning of the fight. This was with 4 druids, monk and a holy priest healing, so not much uncontrolled absorbs. Weakened blows was on the boss. Hits seemed to be around 200k then, as I mentioned. And this is, as said, as a DK, with about 60% damage reduction total (55% + blood presence). This seem to be supported by your random log too, so perhaps a raw damage of 500k for normal melee then. So i’m a 10m Heroic BDK and want to get more involved with improving the DK module of SimC but I’m not really sure where to start as my familiarity with coding is mostly HTML/CSS/JAVA based. Is there anything I can do to get started with this? Also, there are usually a few people awake in the #simulationcraft channel on irc.stratics.com that are willing to answer questions, especially for new devs. And the project owner is known to be very welcoming to anyone asking for commit access…. – Vengeance really is too high. I’m not sure values why – DTPS seems to be more or less close to truth, but vengeance isn’t. I wonder it’s calculated wrong? Because of that, self-healing seems too good. – Sacred Shield shows average interval of 13-15 seconds for some reason. Is something wrong there? – I’m a bit surprised by different value of hit and expertise. What could be the reason? – Colossus enchant seems to have extremely low effect on TMI. Lower than margin of error – I got 0.1% better results when I disabled it. Note that they’re all slightly above the calculation because of the extra DoT damage we’ve ignored. Not sure what you mean about hit and expertise? Colossus will likely have a very weak effect on TMI for larger bosses, which is fairly consistent with how it works in-game. It was a decent effect when the boss hits you for 100k, because that’s 8% reduction off of one swing. When the boss is hitting you for 340k, it’s only a 2.35% reduction. That’s why most of us stopped using Colossus in favor of Windsong or Dancing Steel during T15. I guess the point would be more like, judging from LFR here, that the vengeance values is much to high for most bosses other then Lei Shen, because they simply hit too weak. This makes it so that the numbers you usually see ingame is much less then what the sim produces. Ah, I get it about hit/expertise value – I just forgot about different Judgment hit chance, that’s why hit is worth more. Colossus – some rough calculations show it’s value at something like 500-1000 mastery even at 900k swing (more when you already have some cooldowns up). I might be doing something wrong though. As for vengeance – yeah, I know it’s supposed to be that way, but I just wonder if it really is. DoT damage is added – but what of numerous “cast breaks” when boss doesn’t swing? And does Weakened Blows also lower it or do you already count it? Just did LFR Lei Shen to test it – used addon to watch vengeance, and only tankswapped on last phase. Top for all fight was 153k – and that’s during Decapitate debuff with 50% more damage taken. During normal melee phase it stayed at ~110k. Average was 100k, but that’s not really saying much because of intermissions. It also seems that LFR hits are more like between 400-500 (didn’t log it, but that’s what I managed to deduce from in-game log). One of reasons I can see for low vengeance is that – pretty often – there isn’t 20 seconds of continuos damage, and out of each 20 seconds you only get 15-sec worth of vengeance. I’m pretty sure that 15 seconds of damage with 5 seconds intermissions should offset paladin survival in negative way, since we don’t get full vengeance(= healing), but we do get full danger. In fact, I think I can already see this when switching from Patchwerk to Ultraxion model – assuming Ultraxion simulates correctly. When I changed T15N Patchwerk -> T15H Patchwerk, DTPS went up by 24%, and healing by 18%. BUT – when I changed T15N Patchwerk -> T15N Ultraxion, for 17% damage taken increase, healing only increased by 2%. It would be interesting to see Ultraxion model with same DTPS as Patchwerk instead of extra damage. Note that I’m a 10 man raider, not a 25 man, so I’m focusing more on DPS output than survivability. Hence the low health, DPS metagem, DPS cloak, etc… I usually swap the Spark of Zandalar for the Soul Barrier if I expect a heavy damage input. Also: What does “Position: Back” mean? Also: Is it possible to see the effect of the tanking metagem instead of the DPS one, without having to go in game and replace the actual gems? Thanks a lot for the detailed guide! This isn’t actually that uncommon, believe it or not. In the ~40% haste regime haste seems to get stronger than usual, and I’m not entirely sure why. My guess is that at this point, the combined power of the raw self-healing done by SoI and SS absorbs and high SotR uptime (you’re at 75%) means that you’re rarely, if ever, taking a spike larger than your current health. At that point, stamina isn’t going to help as much as simply increasing that self-healing throughput. If you look at the “procs” section, you’re getting an SoI proc every 1.1 second and a Sacred Shield tick every 3.7 seconds. That means that every boss attack is getting blunted by at least one SoI proc (~20% of a boss swing) and every ~third boss attack is getting ~50% shaved off by a Sacred Shield absorb, in addition to any SotR uptime. Also, your ilvl is very high – 538 is already nearing the point of overgearing the boss, so you probably have enough stamina from gear already. Even against a boss that *can* hit for 340k, 760k health raid-buffed isn’t so bad when every attack is reduced by 20%, every third attack by 70%, and 3/4 of attacks by ~50% via SotR. It looks like the default simc file it sets up on import puts you in position=back. The sim ignores that for tanks anyway (you’re getting blocks and glances), but I can fix that easily enough so I may as well. Regarding the tanking meta gem: Yes, you can either edit the text of the simulate tab by hand (i.e. replace capacitive_primal with indomitable_primal) or load your character into AskMrRobot, swap out the gem, and export the setup to SimC format. Then just copy/paste that in place of the gear section of the Simulate tab. You only need to copy/paste the “head=” line, since that’s all you’re changing. Thanks for the reply. I thought there would at least be some diminiutive return for Haste, but that seems untrue. I tried the other metagem, and my DPS drops from 277k to 249k, but my TMI drops from 4546 to 2669. The latter feels like a big drop. It’s hard to tell how much of a drop it is, but it should now be easy to compare to different changes on my character. Guess I’ll try messing with and without 4 set next. Not sure how much this would work on your side, but what’d be convenient is if there was an AMR subtab in SimC’s import section, as that’d effectively let you alter your gear and stuff directly within SimC without having to do it externally then export and copy/paste the results. I tried to do this with the CharDev subtab, but it’s apparently incomplete and/or broken. No ilevel 600 cloaks in its database, no support for ilevel boosts that I can find, and it just gives me an error when I try to generate a SimC simulate. Long-term, yes, I’d love to do that. Adding a sub-tab is a lot of GUI work though, so it would take a lot of time. Time which, at this point, would probably be better spent on improving core functionality. I think CharDev was abandoned a while back, so I wouldn’t expect it to be updated any longer, unfortunately. I’m a 10H tank (http://eu.battle.net/wow/en/character/kazzak/Kortane/advanced), and I simmed against a 25N and 25H boss. It looks like the 25H sim tells me more than the 25N sim, right? Mastery and haste look very close together. I do try to get more mastery on my gear without sacrificing hit/exp/haste, especially through reforging. Is there ever going to be a point in gearing where more mastery will be better than more haste? Yeah, the 25H sim will give you more detailed information (and more accurate stat weights) than the 25N sim. The improvement each stat is giving you is much smaller in the 25N, so it’s harder to be as confident of the actual values. So next tier we MAY see mastery edging haste? I know the 50% haste soft cap is achievable at the moment with lucky thunderforged gear drops. Next tier though, 50% haste looks a certainty even in 553 normal gear, especially considering upgrades are apparently staying for 5.4. I’ll be interested to see where stat weights head at that point! As a side note, thanks for doing all this work with Simcraft for us. I’ve been jealous of other specs being able to sim so easily for a long time now! Entirely possible. It really depends though, Sacred Shield and Seal of Insight are both very strong effects, and haste will continue to affect them above 50%. But my guess is that while those effects are non-trivial, they’re not the bulk of haste’s value. it will probably drop to the back of our priority list at that point. So I did some checking around, and noticed I wasn’t getting any additional HoPo from the set bonus. A quick look at the buffs told me that I was never affected by Divine Protection. Is there a reason why Divine Protection is currently not part of the rotation? I can understand that it’s a cooldown, and not steady state, but it’s essential to determine the value of the 4 set bonus. I took out all cooldowns at one point while I was deciding how many and which cooldowns should be in there by default. You’ll get a very different result casting DP, GAnK, and AD on cooldown than you will if you ignore all three, obviously. The thought at the time was that you’re not very likely to die from melees when you have any of them up in the first place, so you’d get better information by disabling them all and simulating each iteration as if the whole thing were unaffected by cooldowns. Otherwise you’re averaging the stat weights during “safe” periods with the stat weights during “dangerous” periods, which taints the results. I’m still a little mixed on which to put back in, but I’ll probably at least re-enable DP. I see how that’s an issue, and I assumed that was the reason DP wasn’t enabled. The problem is of course when these cooldowns interact with specific gear, such as T15 4 piece, or for example the T16 trinket that reduces cooldowns. Would there perhaps be a way to include the HoPo gained from DP without actually including DPs effects? I guess it wouldn’t be too hard to include a 0% DP, but that would generate more HoPo than the actual DP. For tanks should’nd be it “position = front”.? Yeah, that’s just a reporting error that’s been fixed in 530-6. My TMI is >100k Pilou will kick me soon. I changed it because I had weird stats weight, positive dodge/parry/str, I think it’s because “incoming_damage_5s” was too high and the simulator didn’t DS when it parry/dodge. It is also more realistic (except for a few encounters), keeping one set of runes for the big hit, and don’t waste the other set. But it changes with “incoming_damage_5s>=health.max*0.5″ so it’s difficult to put it in a real life situation. Ok, so I feel like I have ran into some “weird results”. And sorry this is so long… I ran the simulation on my paladin a few days ago when he was gemmed/reforged based on the default weights at askmrrobot.com and something mildly strange happened. The results showed crit as being a positive number. I was confused by it at the time, like, how can adding crit make me more likely to die? I lost the results page, and couldn’t duplicate it (and started running 50k iterations instead of 10k from then on) but I mostly just figured it was a margin of error issue and since its was really tiny and i don’t have a lot of crit on my gear anyway, i went about my business. Now, keep in mind, I am pretty new, so this all could be user error. Anyway, I updated to the latest version to see if there was any difference in what I should be doing with the EF change, and I noticed a T16N10 option in the boss drop down, so i figured I would start working with that. First sim came back with something like 365k TMI. I was a little shocked, as I may not be getting deep into SoO, but i am tanking normals and not even noticing a survival issue yet, but ultimately it had me more worried than anything as I assumed that meant the later bosses would start hitting me like a mac truck. So, I decided to dig deeper. I saved the html page and used the askmrrobot link to have mr robot optimize my gear with the simulated weights, which, were weird… it had haste low, mastery high, stam lowish, str below parry. It was really strange. I exported from AMR back to simc to see if I actually gained any TMI. I did, I gained a TON. it was down around like 35k-ish. But, now the weights are all different again, and this time actually has haste and stam back above mastery and they make a little bit of sense, so i did the same process over again. Had mr robot optimize, then exported to simc, and ran it all again. TMI lower still. Weights starting to hold steady-ish. Long story short, I did that like 2-4 times until the end results from mr robot were the same gems/reforges despite slightly different weights. All in all I was happy, my TMI was down. So, is there a reason that flat out adding parry or crit could cause a prot paladin to be less likely to live? Am I misunderstanding something? Am I just breaking the system through sheer perseverance to the point the numbers are meaningless? After the first night, I got better about saving the html outputs and not clearing the simulate tabs in simulationcraft. In fact, I still have the complete results tabs for everything I did since I got the upgrade. I just don’t know what information would even be useful to you (or how to get some of it to you at all, i don’t have a website to upload the html files too, unless google docs has something I could use…) I could pastebin the action / gear list files so you could run the sims yourself (not sure they will spit exactly the same results, as they vary slightly if I re-run them). Or am I doing something obviously wrong or making an obvious mistake in general? Update here. I copied the askmrrobot simc export over from the default stat weights they use, and here are the results. It looks a little off, but all the info is still there. It has mastery, strength, doge, and parry all positive numbers… Getting really confused now. Running some tests on your character, because that does seem strange. Best guess at this point is that it has to do with you being below expertise cap, or else a bug in 530-3.